The tarot is the LittleWorld, the representation of the Big World, just as a map of the world is the representation of our terrestrial globe. It is the microcosmic representation of the macrocosm. This universal aspect of the tarot – la Rota (the wheel) – makes it an ideal tool for divination. In the same way that the navigator finds his way with his nautical charts, the consultant navigates his way through life with the tarot cards. Even if, in my opinion, divination is not the main aim of the tarot, the tarot of Viévill, with its amazing precision and coherence, lends itself marvelously to divination. 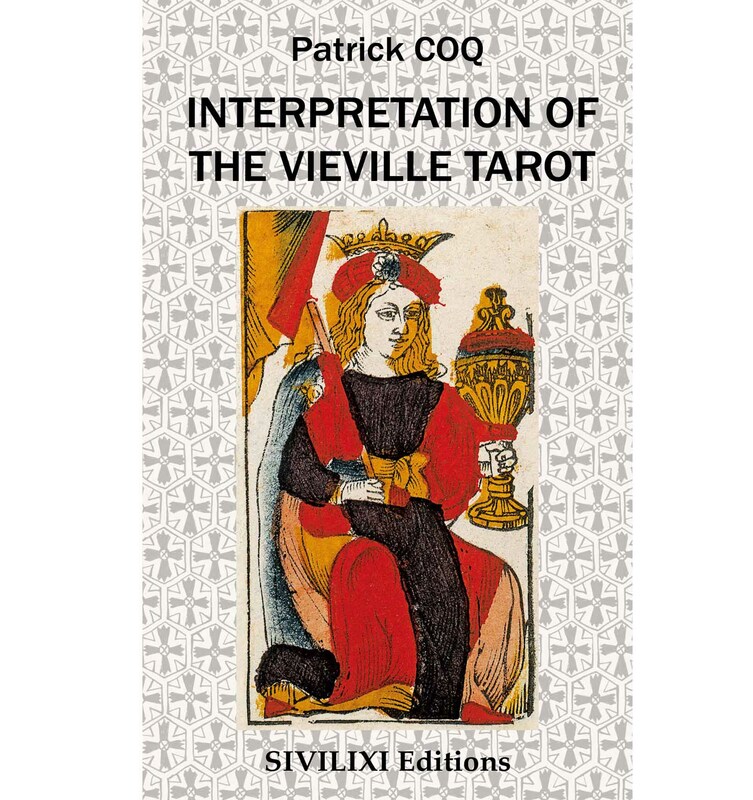 Based on my two books, The Mysteries of the tarot of Viéville where I endeavoured to decode the luminous message of the Viéville, I am now proud to present a condensed work, Interpretation of the Viéville tarot (translated from the french by Ann O’Donnell), which proposes a synthesised interpretation of each of the 78 cards. With the help of this practical paperback of 111 pages, (18 x 11cm) the reader will find a synthetic explication for each of the arcanas in the deck. This will be a considerable help for divination (using the 7 card draw method, majors and minors together which is particularly powerful), and also a supplementary occasion to understand this magnificent tarot. Esoterically, the creation of the world from Cosmic Ideation. The solar system; the earth, the cell, Anu or the primordial atom. The original cause, the beginning, the seed, the central nucleus. All future developments contained in the germinating seed. The primary sensation of our existential centre, of our place in the visible universe and in the terrestrial hierarchy. The perception of priorities, of the order of things, of the hierarchy. The guiding principle. In a general sense, the beginning of action. Delay in beginning, business off to a bad start. Loss of orientation. In alchemy, it is the representation of the Rebis or Hermaphrodite, the divine androgyne, the emblem of spiritual perfection coming from the fusion of the polarities, the meeting of opposites. The arcanum XXI symbolizes a superior state of consciousness and regained unity resulting in a higher vision. In its highest universal sense, the arcanum XXI represents a new era, great spiritual and social progress. The mastery of cosmic forces and the four elements: balance and self control where spirit dom-inates matter. Symbolically it is the state of innocence and purity which finds its analogical equivalent in the spontaneity of the child (sometimes with a mischievous side). The beautiful aura which reflects good physical health. In a general sense it is the culmination of a long process, mainly of a spiritual and psychic order, and, depending on the surroundings cards, crowned with success. Literally, it is the world upside down, confusion and chaos. All progress is held up, division rather than union reigns. In its universal sense, depending on negative surroundings cards, the Arcanum XXI represents an era of lies and impurity where the coarsest materialism reigns. You will find this book in the shop Buy on line. It is now available in a beautiful red and black gift box, along with a deck of the Viéville tarot cards.